The Access 4 All Spokane coalition wants to empower people in retail, hospitality, public services and health care to confidently provide disability-friendly customer service. “Making Welcome” provides practical tools for anyone who wants to promote great customer service for all abilities and all ages in our area. There is no charge. Snacks will be provided. These “Accessibility Ambassador” sessions are made possible through the Spokane County Accessible Community Advisory Committee and the Governor’s Committee on Disability Issues and Employment. Access 4 All Spokane coalition wants to empower people in retail, hospitality industries, public services and health care to confidently provide disability-friendly customer service. Monday, January 28, 8:00 a.m. to 12:00 p.m.
We are asking for your help this season to make our area safer and more welcoming for tens of thousands of your neighbors, visitors and customers that have disabilities. 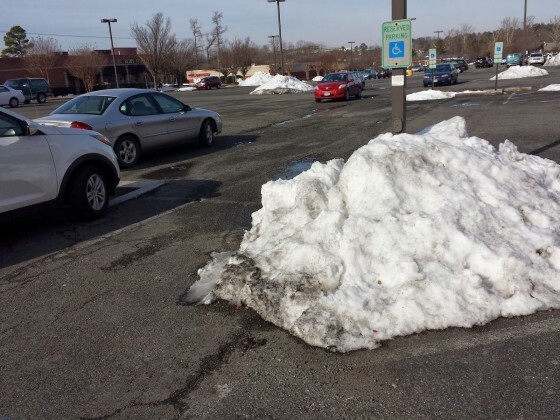 Our message: Please pay extra attention to making sure parking spaces reserved for people with disabilities are fully cleared of snow and ice. 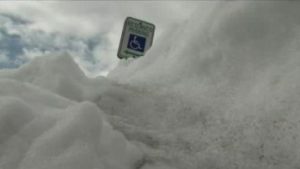 You’d be surprised how many parking lots in previous winters actually had snow piled onto those blue or white wheelchair symbols and access stripes! Some had dangerous patches of ice in those spaces and on the sidewalks and walkways going into the buildings. Chances are you and your employees have worked hard to keep snow and ice out of those (formerly known as “handicapped”) accessible spaces and walkways. If you have been doing that, thank you so much. Access 4 All Spokane is a team of local leaders that work together to celebrate and encourage accessibility and disability friendliness for people with all sorts of disabilities and ages. We want you to know we do pay attention and we appreciate your thoughtfulness and efforts regarding this important safety issue. Access 4 All Spokane presents “Making Welcome”, a fun and interactive session on how to confidently provide disability-friendly customer service. “Making Welcome” is geared toward anyone who wants to promote great customer service for all abilities and all ages in our area. Alisa Rudolph and Dave Reynolds, co-founders of Access 4 All Spokane, will appear as guest on KYRS Radio’s SOS-Spokane program, Thursday, October 4, from 1:00 to 2:00 pm (Pacific Time). Go to http://kyrs.org and click on the “Listen” button or tune in to 88.1 AM or 92.3 FM. Saturday, August 18, Access 4 All Spokane will be at Unity in the Community, 10:00 to 4:00 at Spokane Riverfront Park. This is our fourth year celebrating accessibility and disability friendliness at the Inland Northwest’s largest annual multi-cultural event. Stop by. Say “Hi!”. Introduce your friends. Here is a picture from our first Unity in the Community event in 2015. 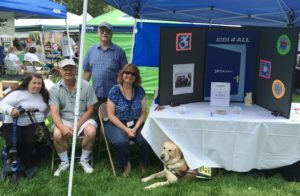 Access 4 All Spokane members Jude Cormier, Bryan Branson, Dave Reynolds, Alisa Rudolph, and Casey the Dog Guide under the 2015 A4A Spokane exhibit table. Thursday, July 26, is the 28th anniversary of the signing of the Americans with Disabilities Act. Even though A4A Spokane and our Spokane County Accessible Community Advisory Committee are taking a summer break from out regular meetings, we will be celebrating this important landmark by presenting our Advocacy For All Workshop. This is an interactive event. Together we will explore ways to work collaboratively toward long-term solutions where everybody wins! Kudos to City of Spokane for putting together this public service video on the importance of accessible parking, and for featuring Brett A. Bunge, a new member of the Spokane County Accessible Communities Advisory Committee.